Get a shot of adrenaline on this thrilling 1.5-hour quad bike safari from Side and prepare to get dirty as you traverse muddy streams, skid along dirt tracks and wind your way through pine forests. This off-road circuit is the most adventurous way to experience the Taurus Mountains and there’s no experience necessary so everyone can give it a go. 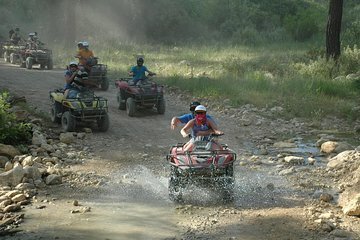 I found the Quad Bike Safari very enjoyable since it was the first time I ever rode on a quad bike. The guides lead us at a very slow pace, which was a little annoying, but there were certain times where we could accelerate and get a bit of speed.